Below you can find driving directions from Google Maps to help you get from Hollywood Florida to your nearest Fix Apple Now store, situated in Hallandale. You can either copy the driving instructions below or click here for a larger map and driving directions. Talk to Fix Apple Now if you need to repair, mend, fix, reset, restore or replace a broken iPhone 4, 5 or 6, iPad, iPad Mini, Mini Mac or MacBook in Hollywood Florida. Our engineering team are amongst the most skilled and knowledgeable in the business, and you can count on us to do everything in our power to return your Apple device to its former glory. We've returned scores of faulty Apple devices back to full working order. We deal with a host of problems related to Apple devices. Are you experiencing boot loop? Maybe your iPhone 6 won't charge, you're seeing “no SIM card” errors, your Touch ID won't work or you've got red screen? Perhaps your music apps keep crashing or you're faced with a landscape keyboard that won't go away? We can help if your phone is overheating or won't turn on at all too. 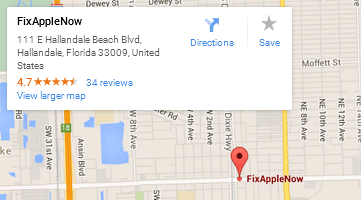 Whatever the case, we can help if you need to repair your Apple in Hollywood Florida, so today.